The two Bogardo Beat pools, Tollmuir Pool and Marcus House Pool, have received a lot of attention this winter. They both have the potential to be good salmon and grilse pools, and if the sea trout return in good numbers, I would expect to see them both offering excellent opportunities for night sea trout fishers. Tollmuir Pool used to be called ‘Monica’s Stream’, but is now called ‘Tollmuir’ on account of its being close the the site of the old toll booth on the Aberdeen road (now the A90). 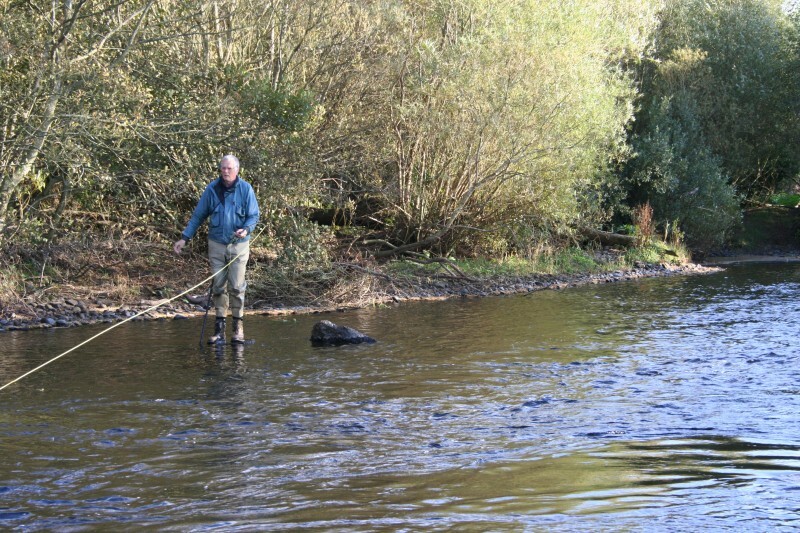 The pool has all the characteristics needed for a top South Esk salmon pool. A great rippling neck to the pool, a really deep (8′ – 12′) dub and a long and gradually shallowing tail. This is a pool where travelling fish are likely to pause and a place for salmon to lie in drought conditions. It is an obvious holding pool. The squeeze formed by two rocky groynes plus the fan shaped tail under the overhanging left bank willows complete the pool which then runs into the Steps over a series of caulds made of rocks. Marcus House Pool is a good 200 yards in length with the main lies all along the left bank under the quarried boulders placed there as flood and erosion protection. House pool is a ‘taking’ pool, and a 17lbs salmon came from the neck of the pool in good water in the summer of 2009. The main part of the pool and the tail hold both salmon and sea trout. The night fishing for sea trout in the tail, as it slips into Breadalbane Pool, can be first class. 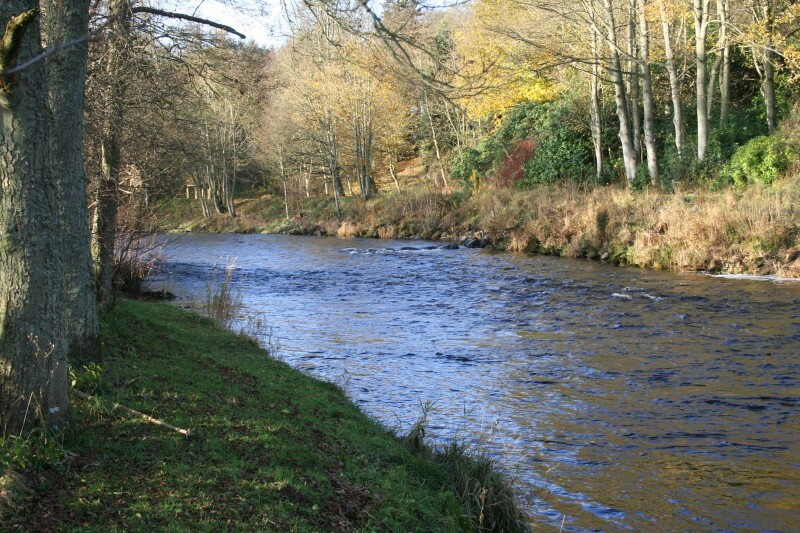 An arrangement has been made with Marcus Estate, who own the left bank, that House Pool will only be fished by Finavon rods from the right bank in return for which Finavon rods will no longer fish Breadalbane Pool from the right bank, leaving Marcus rods exclusive fishing of Breadalbane Pool from the left bank. This means that people fishing Finavon Castle Water must on no account cross the river to the Marcus side (North). These two pools, Tollmuir and Marcus House, are more accessible to anglers, easier to fish, and have greater holding capacity than ever before. I look forward to seeing these benefits reflected in their catches. We heard on the 23rd of December 2009 that our son, David, had died after falling while trekking in Malaysia. We have decided to build a Treehouse in his honour. Scotland’s first fishing hut in a tree! This project is something he and I discussed before he left on his travels on 18/3/2009. We will also put a track from the Aqueduct up to the Red Brae and, using the spoil to make the track good at the same time as digging a pond, we will make a wildlife pond that doubtless will attract many frogs. David loved frogs and ducks, and I’m sure the pond will be home to both species! Like everywhere else in Scotland, this has been a long and cold winter. After the massive floods of November and early December, which should have seen most salmon reach their spawning locations, the weather closed in and the temperature dropped. The result was nearly ideal conditions for spawning and, because river levels have remained quiet (as opposed to a raging torrent) the redds should have been undisturbed to allow the fertilised eggs to gestate in the gravel. The season opened on the 16th of February, and we hear of at least two nice fish (c. 14lbs) caught and returned at Kinnaird, which is about 9 miles downstream of Finavon. The river is in tremendous ply, with the water clean and clear and the bed of the river washed clean by the floods. In places there is some damage, mainly to the banks, but very little change to the depth of the main holding pools. An interesting snippet of news just before the season opened was a report from Steve Hawkins, the river board’s bailiff for the South Esk, that he had seen a pod of early running salmon in the 5-7 lbs weight range running through the Flats on Milton Beat at Finavon. As far as we know, these are the only early fish seen on either the South or the North Esk rivers above the dams at Kinnaird and Morphie respectively. People who fish regularly here ask me what the omens are for 2010. I can only guess that another cold winter will have done no harm to the availablility of prey species in the coastal zone for sea trout. In cold winters, like this one, both zoo plankton and phyto plankton benefit from very cold water temperatures – in much the same way as in the arctic and antarctic regions, where there is such a phenomenal supply of food for pelagic species of fish. If I am right, and I am not a scientist so my comments are at best an educated guess, we may well see increased numbers of sea trout in June, July and August 2010. Finavon is really best known for its sea trout and in the not-so-distant past we could expect catches of 300+ sea trout averaging 2lbs 10oz. 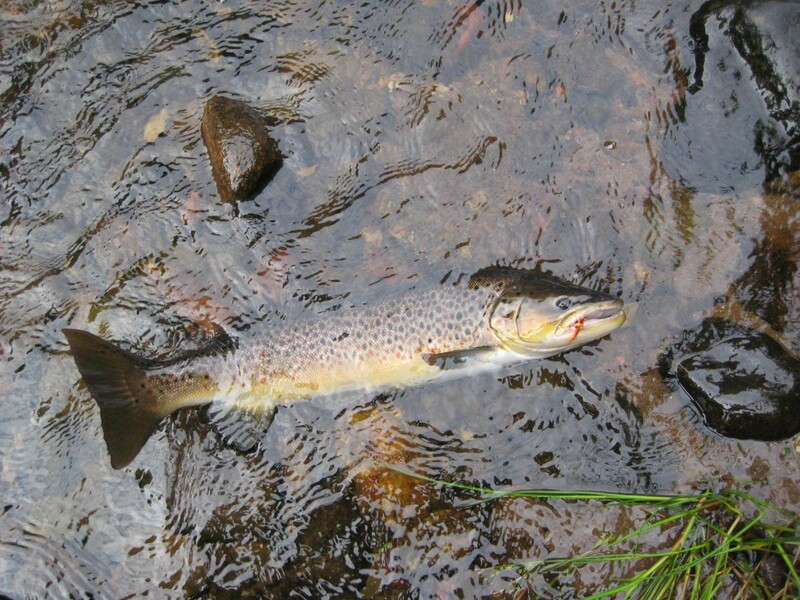 It is becoming likely that we will see a return to such numbers and quality of sea trout. As far as salmon are concerned the picture is mixed. Our grilse vary hugely in condition and there is a worrying trend for two sea-winter salmon (2SW) to return to the river under-weight. Some early running 2SW salmon have weighed as little as 4lbs. Something is wrong in the South Norwegian Sea in terms of availability of food for salmon and grilse. The issue is complicated by the fact that not all our returning salmon and grilse pass through the S Norwegian Sea. Generally it is true to say that the condition of fish avoiding that area is better than those using it as a staging post on their return. The NASCO and Atlantic Salmon Trust’s research into the lives of salmon at sea may reveal what the problem is. As I write this bulletin on the 26th February, the snow is still falling and the high corries, where the South Esk rises, are packed full of ice and snow. We can expect a long thaw, perhaps well into May. If there are spring salmon to be caught they should have sufficient water to enter the river. A long cool spring is exactly what we now need! Meanwhile the nets South of Montrose start operations in May, but they have promised not to kill any sea trout for selling to the fish markets. We therefore have genuine optimism that we will see more fish entering the river, and less being killed by the netsmen. Our responsibility as anglers is to kill the very minimum number of fish. If we can ensure that good numbers of salmon and sea trout reach the redds to spawn, we will have made a big contribution to their conservation. Restraint and good husbandry are the order of the day!